Initially, we planned to take the tube, but then found out that there was supposed to be secure, managed and free cycling parking right next to the venue. Hence, we changed our mind and took the Brommis from Highbury, north London, to Wimbledon, south-west London. Due to the road race and the road closures, we had to take a significant detour. From door to door, it was a ride of 14 miles. It took us one hour and about 20 minutes. Despite the long ride, this was as quickly as taking the tube – and we avoided crowded trains and extremely busy tube stations. Instead, we had a fantastic ride all across the capital. Cycling in the morning through central London on the first morning of the Olympics was a very special experience. Finding the cycle parking at Wimbledon was easier than at the Olympic Park, where the Evening Standard’s Ross Lydall had a hard time working out where to leave his bike prior to the games. 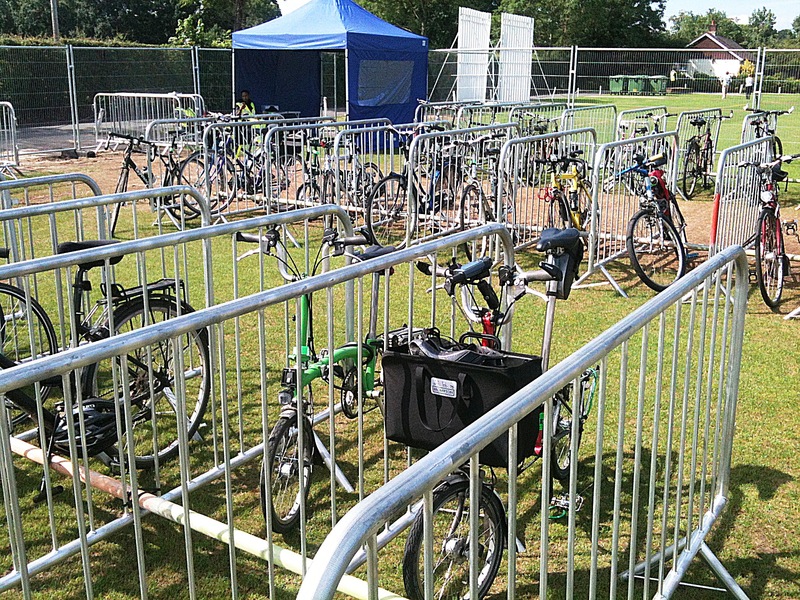 At Wimbledon, the managed cycling parking is located a two minutes walk from the gate 5 right next to the VIP car park. (Unfortunately, it wasn’t signposted for southbound riders but nevertheless we managed to find it quickly.) The bikes are stored in a large gated area staffed by two blokes who take care that nobody with sinister intentions can access the bikes. For additional security, you can lock them to makeshift bike racks. You really don’t have to worry about theft at all. It really feels like being in the Netherlands. If the managed cycle parking should become a legacy of the games for London, this would do such a big difference for cyclist in the city. 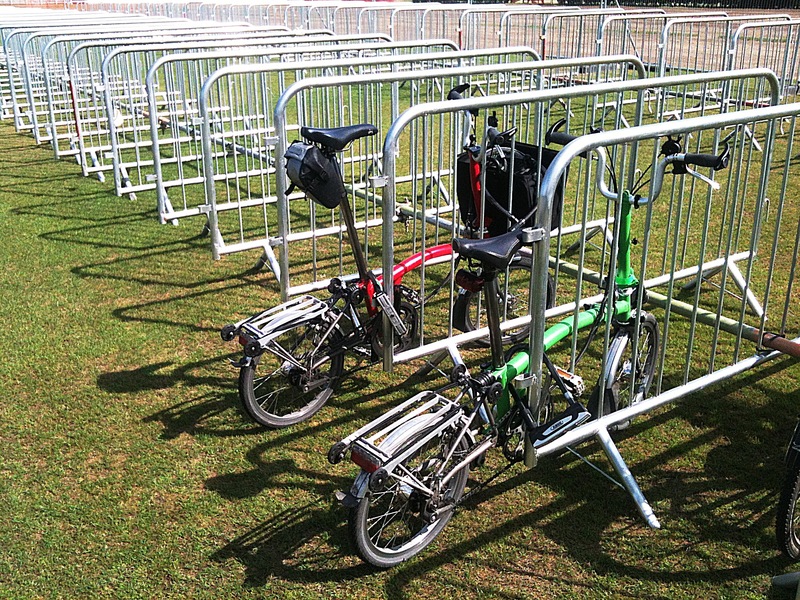 Unfortunately, yesterday only a fraction of the visitors at Wimbledon went for the bike option. I estimate that maybe five to ten percent of the space was actually used. Given the transport nightmare that is called TfL, this is really a shame. Tomorrow, for example, will be the busiest day on the DLR. I can only encourage everyone who has a ticket and a bike to cycle to the venues. I’ll watch volleyball at Earl’s Court in a couple of days. Guess how I’ll get there. In NL they actually have portable temporary bike parking, and the legacy from 2012 might be in keeping the units used at Eton Manor and Stratford High St as portable bike parks for future major events in London. Nice review – I did check out the Stratford sites myself a week in advance, and found the signage weak and the vegetation cover/ambience of the route to Eton Manor bike parking likely to be a bit threatening at night. I wonder if there are any reports/pictures of Eton Dorney bike parking, Weymouth &c. It would inspire confidence for others to cycle. After all you can often get the train to somewhere nearby, or drive to similar location. My experience too, Olaf, at the City of Coventry Stadium for the football last Wednesday. (Belarus v New Zealand; I get all the best tickets!) I spent the evening in the knowledge that two fine gentlemen were looking after my bike. They had given me a numbered wrist band and attached a similar one to my Brommie! I am going to cycle to the Olympics tomorrow for an evening event. Does anyone have any ideas what to do with my lights??? They are the Knog strobe type, which is a banned item, so I can’t take them in with me… don’t really want to just leave them attached to bike either…. how have other people got around this?? Just leave them on your bike and I’m pretty sure you’ll be fine. The areas are gated, and not heavily used. You might also ask the staff who manage the facilities if they can take care of the lights. In both occasions I used the parking facilities (at Wimbledon and Earl’s Court), the guys were really nice – and quite bored. Ditto at “City of Coventry” Stadium. Lights, computer, little saddle bag – all safe and sound. In the bike park, next to my Brommie, was a recumbent with plenty of accessories – no problem! Parents with small children were also leaving their buggies – with all sorts of paraphernalia – in the bike park area. I think you would be fine.